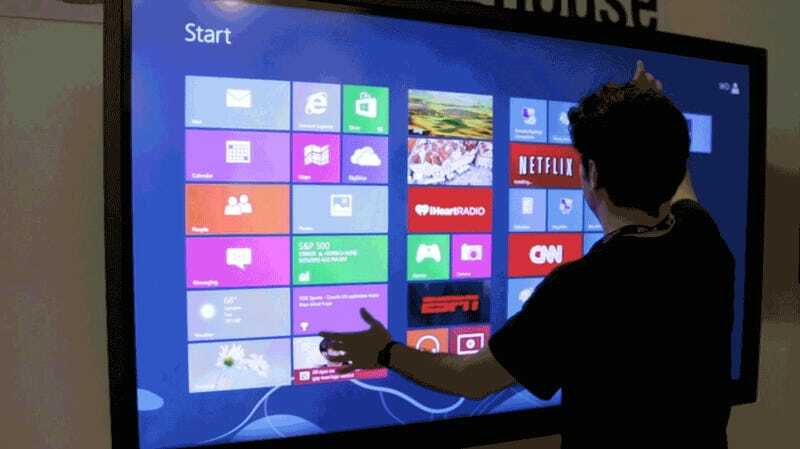 Westinghouse Digital's "Digital Whiteboard" is an 84-inch UltraHD monster that runs Windows 8. It costs $15,000, so for starters, this is headed to the lecture halls and boardrooms of the world. Unless you've got dollar, you won't see this beauty in your living room just yet. Which is a shame, because using it is like touching the future. The Digital Whiteboard's touch technology isn't capacitive like the Perceptive Pixel glory we used for years until Microsoft scooped it up. Instead, it runs a six-point infrared overlay that's baked right into the screen's bezel. Overall the screen is fairly responsive, and Windows 8 blow-up to that epic size feels so natural that this could the platform the UI was designed for. It's remarkable how those Metro tiles scale up beautifully. But the actual look and feel of apps varies when you scale it up. Common web browsing could have a home on this TV, but firing up the Weather Channel app, made today's isolated T-storms forecast feel especially foreboding. Of course, this screen is supposed to be more than just a plaything, so Westinghouse has built some pretty rudimentary whiteboard software so that you can, you know, write on the screen like a whiteboard. I was able to easily scrawl out "hello world" using my finger. The UI for the app isn't beautiful or anything, but it'll suffice. If massive touchscreen computers catch-on, a third-party app surely will as well. And don't be fooled: he screen isn't quite as silky as what you get on your smartphone. There's a slight but noticeable lag on the touch. For all that pixel density, we weren't overwhelmed with the screen's beauty. Then again, it's a freaking Windows 8 PC at massive proportions, so we're willing to cut the screen some slack.